"Little T Speedway," located on the grounds of the famed Thompson (Conn.) Speedway, will serve as home to USAC's newest Mopar .25 Midget member club, the "Custom Midget Club." "Little T" hosted its first race in the spring of 1977 and just completed its 35th season of operation. The sport of quarter midget racing, which dates back as far as the 1930s, debuted in the Nutmeg State in the early 1950s. "We are all excited about being part of the USAC family and the many benefits afforded as members of one of auto racing's keystone clubs," says Gross. "We look forward to a long and lasting relationship with USAC. 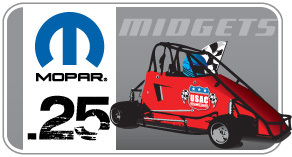 "Obviously we are pleased to have Custom Midget Club on board for 2011," adds USAC Developmental Racing Director James Spink. "USAC has a deep tradition of racing in the northeast and this expansion adds another dimension to our Mopar .25 Midget operations." More information on the Custom Midget Club can be found on their website at www.littletspeedway.com. Highlights of the 2011 calendar for the club will include the Lou Sherman Memorial Race in May and the Little T Speedway Annual Family Fun Weekend in August. The annual awards banquet is slated in November.